Do you have a GREAT idea that you need help developing? 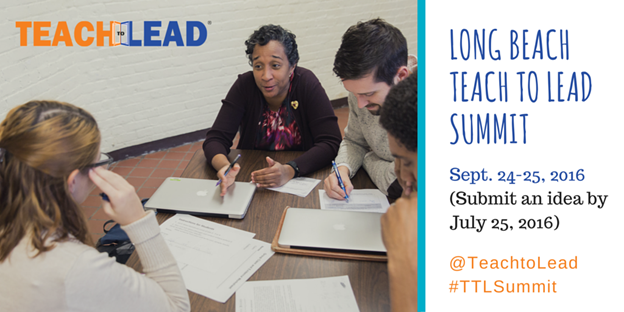 Teach to Lead, sponsored by the U.S. Department of Education, the National Board for Professional Teaching Standards, ASCD and over 120 educational organizations, wants to help you! They will be holding a Teacher Leadership Summit in Long Beach, CA September 24-25, 2016. To attend, you must submit your idea (https://www.surveymonkey.com/r/LongBeachSummit) by July 25, 2016. As space is limited for each Summit, idea submissions will be reviewed and invitations for participation, with registration details, will be emailed to those accepted. If chosen to attend, you can bring a team of up to 5 people for a weekend designed to develop your idea into an action plan you and our team can implement. Each team will be provided with a Critical Friend from a Teach to Lead supporting organization who has skills, knowledge and resources to assist you. Teach to Lead provides lodging (if more than 50 miles from hotel), some meals, and registration for participants.